If the random collection of YouTube videos just isn't doing it for you anymore considering incorporating more in-depth Islamic studies into your Fall routine. It goes without saying that the best option is to get out and attend classes locally, however this may not be a viable option for everyone for a variety of reasons including lack of classes, scheduling conflicts, lack of childcare, or even feeling "unmosqued." Being "unmosqued" however, doesn't have to equal being "un-ilm-ed", as fortunately there are plenty of great resources for in-depth Islamic study online. *Fall-enrollement for these programs are in full swing and will be closing shortly so don't delay. Seeker's Guidance uses a blended model to deliver instruction by combining downloadable pre-recorded lectures with a few live sessions throughout the semester. The recordings are available to listen to at anytime throughout the semester but are broken out into a suggested schedule along with other supplemental readings in order to keep students on track to completion. In between live sessions, students can ask questions of the instructor and interact with one another on the class forum. Courses cover a variety of subjects including practical matters such as marriage, parenting and Islamic finance, to more spiritual pursuits relating to purification of the heart, as well as fiqh, hadith and Qur'an memorization. Rayyan Institute offers live sessions and makes recordings available to students who may have missed the live class or want the opportunity to review. There are seven classes currently being offered which fall under the categories of aqidah, Qur'anic sciences, hadith sciences, fiqh, and tazkiyyah. For students who are looking to receive a certificate for the Foundations Program, there are a total of 19 required courses and 4 electives. Rabata ( Tuition-based) For Sisters Only! The Ribaat program is a four-level program offering college-level courses for women, taught by women. This program is no slouch in the rigor department encouraging live attendance as well as requiring research papers and tests. Don't think that just because the Ribaat program is ladies only, the only thing covered is the fiqh of pregnancy and menstruation! Nope! The program offers women the opportunity to study seerah, usul-ul-fiqh, tajweed, Qur'an & more. The resources below are all pre-recorded classes which have been archived and put into extensive learning libraries. The learning libraries aren't just random collections of videos, instead they are organized into courses that dive deep into a particular topic generally offering at least four hours of content on a given subject. The two main differences between the semester options and learning libraries are that there is no set start or end date and that there is no Q&A or other community interaction built in. The fact that there is no set "semester" offers the ultimate flexibility for adult learners with busy and sometimes unpredictable schedules. There are numerous advantages to learning alongside others including benefitting from their questions and insights, as well as the encouragement and social support that can make a difference when all the things on your plate start to overwhelm you. One way to combat this when using a learning library is to make an effort to build your own community by perhaps working study time into family time, inviting some likeminded friends to take the course along with you to keep each other accountable, or even find a study buddy via social media who is interested in the same subject. Going into one of these classes with no study plan, no time set aside and no accountability is a surefire way to ensure you won't complete the course. The ILM Flix website recently underwent an update which makes it not only visually appealing but easy to navigate. ILM Flix has over 20 full length classes to choose from, consisting of more than 100 hours of content. 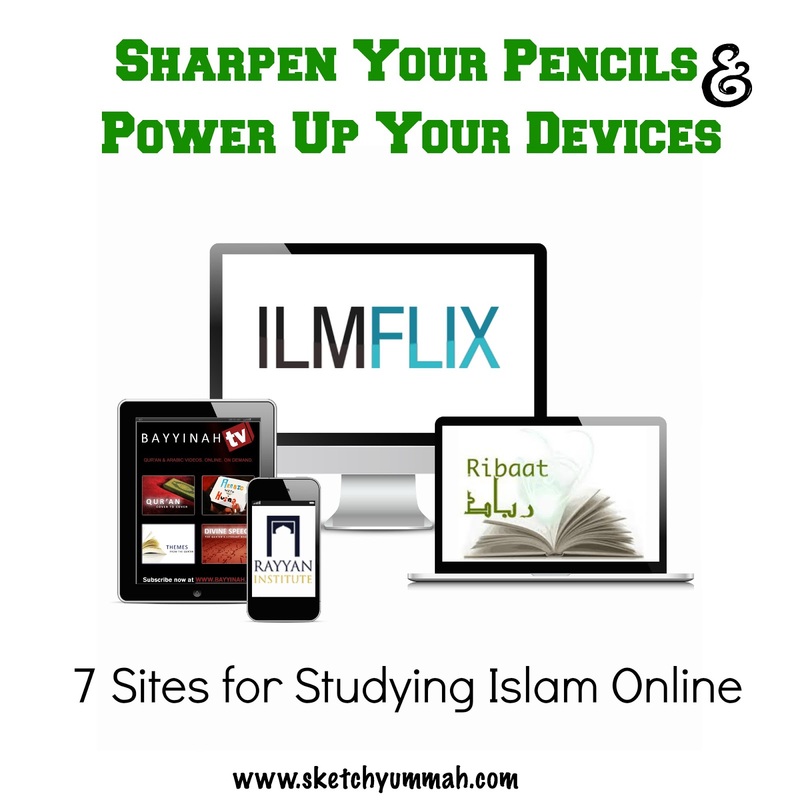 Topics in the ILM Flix library range from Tafsir and Fiqh to History and Spirituality. Though using the library requires self direction the site has built in tools to support social sharing and has a feature that helps you track course completion by marking off when a session is finished. For only $11 a month, Bayyinah TV subscribers get access to an ever growing library of videos featuring Ustadh Nouman Ali Khan. Unlike some of the other learning libraries that cover a breadth of topics by spending a few class sessions on each, Bayyinah TV is more interested in depth focusing only on Qu'ranic Arabic and Quran. The site offers four courses, Arabic with Husna let's you journey along as Ustadh Nouman teaches his daughter in over 90 bite sized lessons; Quran: Cover to Cover features over 200 videos focusing on translating the Quran with all it's subtleties; Divine Speech is a course with over 15 hours of discussion on the Quran's literary beauty; and finally Themes from the Qur'an focuses on well themes from the Qur'an. A project of Huda TV, Huda Academy is a learning library that offers students a variety of course options. Each of the nine courses is delivered via a series of 13 video lectures, with 3 of the courses being offered for free. The courses include Arabic, tajweed, hadith, tafsir and fiqh. If you are interested in live one-on-one study, they offer private Classical Arabic and sister's tajweed classes via the computer as well. For only $9.99 a month Zoojaja aims to deliver on the promise of being "the Netflix of Islamic HD quality videos." Zoojaja is a product of the Foundation of Knowledge and Development (FKAD) and is a budget friendly way to access the courses that they offer the students enrolled in their associates degree program after the semester is completed. While most of the courses are taught by Shaykh Shakiel Humayun and the other core teachers for FKAD the library also features videos from weekend conferences featuring scholars from other popular institutions such as AlMaghrib Institute, Quran Weekly, Mishkah University and Huda TV. This is a very useful post! Jazakumullah khair.